Puma Exploration (TSXV:PUMA; SSEV:PUMACL; US:PUXPF) is a junior resource company focused on exploring and developing their flagship Murray Brook base-metal project in New Brunswick, Canada, where the company has been since 2005. The property is located within the confines of the Bathurst mining camp, which boasts mining infrastructure including access to a sea port, a lead smelter and a skilled labor force. In addition to the Murray Brook project, Puma Exploration has holdings in three other copper, lead and zinc projects in the province: Turgeon, Ann’s Creek and Nicholas-Denys. While Puma Exploration currently owns an option for acquiring 100% of the Murray Brooks property. Due to the property’s bluesky potential, the company is working on both development and exploration by producing an updated PEA while conducting exploration programs, including a planned 5,000 meter drilling program to start in November 2017. When measuring the potential success for their projects, Puma Exploration executives point to the combined influence of the region in which they are situated as well as the current trends in the zinc market. 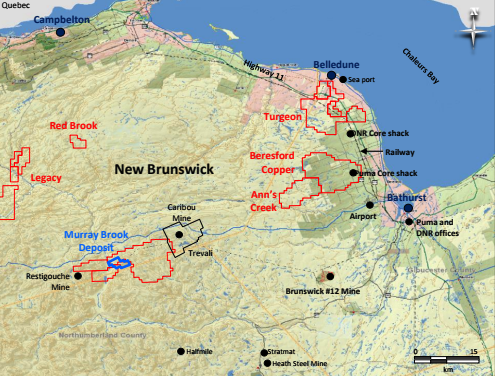 The Bathurst mining region of New Brunswick is considered to be prolific in base metals and the company’s flagship property has a measured and indicated zinc resource of 610 million pounds. This positions Puma Exploration quite favorably in a market that is facing rising prices in anticipation of a looming supply deficit. The Puma Exploration management team is one with extensive expertise in the mining and finance industries. The team includes President Marcel Robillard and Chairman Arness Cordick, who each own 7.5 million and 13 million shares, respectively. The New Brunswick Bathurst region is a jurisdiction that is very much open to hosting mining projects. Based on its mining history, Bathurst is one of the most prolific zones for base metals in Canada, if not the world. As it sits within the boundary of the Bathurst mining camp, Puma Exploration’s project is supported by previously established infrastructure including paved roads, railway services, access to a sea port, smelter, operating mining companies and a skilled local labor force. The region is also known for having hosted the Brunswick #12 mine, which was one of the largest underground zinc mines in the world. Murray Brook is an undeveloped deposit with low-grade open pit potential and a high-grade underground resource. The property boasts historical resources from a 2013 PEA for a low-grade open pit: 1,078 million pounds of zinc, 183 million pounds of copper, 390 million pounds of lead, 23.9 million ounces of silver and 338,000 ounces of gold. This is within historical Measured and Indicated resources of 17.9 million tons with grades of 2.73 percent zinc, 0.47 percent copper, 0.99 percent lead, 41.7 g/ton silver and 0.59 g/ton gold. This resource was developed as a result of drilling programs that were conducted over the course of 2010 to 2013. Results from these programs included 11.94 percent zinc over 23 meters, 11.10 percent zinc over 24 meters and 10.90 percent zinc over 20 meters. 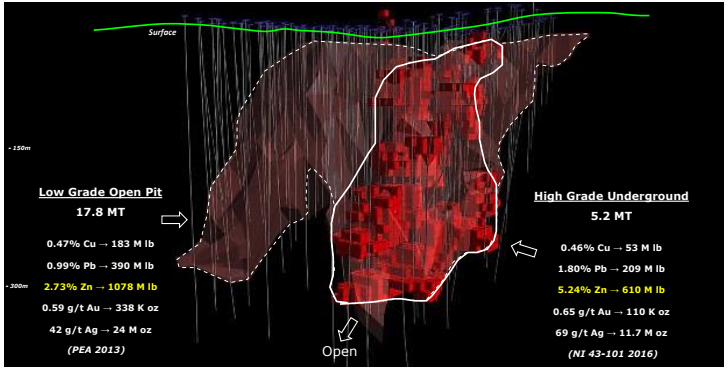 When conducting due diligence on the property, Puma Exploration completed a NI 43-101 underground surface resource estimate on a subsection of the historical resource, narrowing in on a high-grade underground segment of the deposit. This secondary resource estimate presented a Measured and Indicated resource of 5.2 million tons with grades of 5.24 percent zinc, 0.46 percent copper, 1.8 percent lead, 69 g/ton silver and 0.65 g/ton gold. Since the acquisition of the property, Puma Exploration has been managing the Murray Brook property in a two-pronged approach: development and exploration. With a focus on developing the project, the company is working to produce an updated PEA for the property, based on 2 distinct scenarios. This PEA will help determine the best approach for extracting the resource and will establish a CAPEX figure for the project. In parallel, Puma Exploration has also been conducting additional exploration initiatives to help grow the resource. To begin with, the company launched an initial field work program in May 2017, which was followed by trenching activities on the eastern segment aimed at providing the best access to potential target areas on the property. On August 23, 2017 the company announced the start of its first drilling program on the property. This included the drilling of three holes with one measuring 550 meters and looking to test the depth of the massive sulphide deposit at surface. The other two holes were used to verify the copper mineralization discovered in the southwestern portion of the deposit. 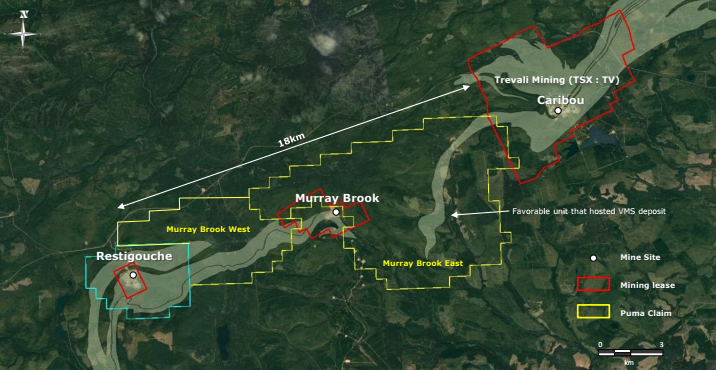 “We are most excited to launch our own drilling program at the Murray Brook Deposit as it is the first drilling program conducted on this mining lease property since 2013,” noted Robillard. Following these initial drill holes, the company will be launching an additional 5,000-meter drill program to begin in mid-November 2017. 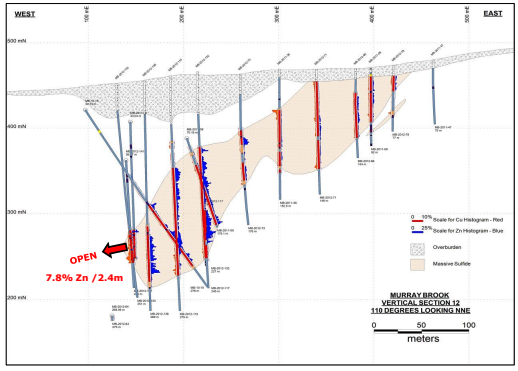 As the Murray Brook deposit is open both on-strike and at-depth, Puma Exploration sees significant opportunities for continuing to identify drill targets and conducting further exploration initiatives on the property. The Turgeon project is a wholly-owned 5,359-hectare property located on a mafic volcanic sequence, five kilometers south of New Brunswick’s Belledune deepwater port. To date, the property has seen 30,000 meters of drilling since 2017. Puma has been working on expanding the historical resources and discovering new lenses. Puma Exploration’s Ann’s Creek silver-gold-lead-zinc project is also wholly owned. The property consists of 122 claims that are located 23 kilometers northwest of Bathurst, NB. The project boasts a high-grade silver lens with high grades of gold, zinc and lead as well. The property has a historical resource of 1.1 million ounces of silver with 0.78 million ounces of inferred resource. Since the latest resource estimate in 2008, a further 84 holes (20,000 meters) were drilled. The wholly-owned Nicholas-Denys project is adjacent to the eastern border of Puma Exploration’s Ann’s Creek property. The property has year-long access from Highway 11 and has an intersecting power line. Puma Exploration has outlined a porphyry system of four kilometers by four kilometers and has identified IP drill-ready targets. Past exploration results for this project include 0.065 percent molybdenum over 200 meters, including 0.08 percent over 117 meters. Marcel Robillard is a geologist who graduated in 1993 from the University of Quebec in Montreal. He also holds a Master of Earth Sciences obtained in 1995. From 1998 to 2007, he acted as a project geologist and project manager for Géominex, a consulting firm in geology and mining exploration. Since 2000, he has been president of Puma Exploration in addition to being direction manager of this company since 2010. He is also a director of the company Komet Resources Inc (KMT) and BWR Resources (BWR). Arness Cordick is involved in brokerage and finance industries for over 25 years. In the past, he was a broker with LOM Western Securities Ltd from 1980 to December 1989. Richard Thibault graduated in mining engineering from Queen’s University of Canada in 1978. He has over 32 years of experience in engineering, operations, management and as a consultant in North and South America. He is currently president, direction manager and director of Antioquia Gold Inc a company with mining exploration interests in Colombia. From 1996 to 2006, he worked in Argentina, Bolivia, Chile, Colombia, Ecuador, Mexico, Panama, Peru and Venezuela. When he lived in Buenos Aires, Argentina, he held the position of president of High American Gold Inc, a junior mining company in addition to being managing director of Procesadora Boratos Argentinos SA, a private industrial mining company. In Santiago, Chile, he was managing director of BGC-AVOT Engineering. In 2006-2007, he held the position of vice-chairman, minerals Daleco Resources Corp., a public company with its head office in the United States. Before returning to South America, he worked for the Canadian company, Fording Coal Ltd in various positions of responsibility. He is also director of Argentex Mining Corp.
Anne Slivitzky was president of Maudore Minerals Ltd from 1998 to 2004. Since then, she has continued to act as a director of this company and other public corporations. She has a university degree in project management. From April 2008 to December 2008, she acted as development coordinator for A2EP-Roche in New Caledonia. She was a member of the Montreal advisory board of the TSX-V from 2002 to 2004, president and director of the Quebec Mineral Exploration Association from 2000 to 2004 and director of the Prospectors and Developers Association of Canada from 2000 to 2008 for which she worked on various issues relating to financial matters of public companies. Dominique Gagné, geologist, has 12 years of experience in the field of mining exploration and graduated in geology of resources and geographic information systems from the University of Quebec in Montreal. He began his career as a junior geologist for various projects for Debeers Canada, Xstrata, Iamgold and Consorem. Between 2007 and 2013, he acted as project geologist for Géominex, a consulting firm specialized in mining exploration. Since August 2013, he has been vice-chairman of Puma Exploration. He is a member of the Order of Geologists of Québec and of the Association of Professional Engineers and Geoscientists of New Brunswick. *Disclaimer: The profile provides information which was sourced and approved by Puma Exploration in order to help investors learn more about the company. Puma Exploration is a client of the Investing News Network (INN). The company’s campaign fees pay for INN to create and update this profile page, to which links are placed on Investingnews.com and channel newsletters. By completing this form, you are giving consent to receive communication from Puma Exploration using the contact information you provide. And remember you can unsubscribe at any time.